This is great!!!! Yeah - it got down to 32 last night...had to turn on the heat this morning - LOL! very cute card!! love that line from jillibean!! congrats on your guest over at lyb- i saw that the other day!!!! have fun!! I love the design on this card. Great job. congrats. i love this card. very fall and fun! I love that big circle of the wood grain. 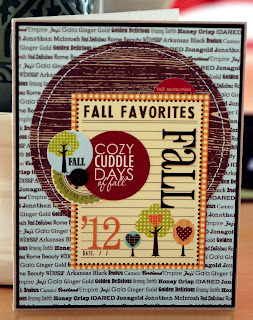 A perfect Fall card! I like it, I always love woodgrain accents. Cute! The mix of pp is great! I love the brown woodgrain against the blue background! Gorgeous!